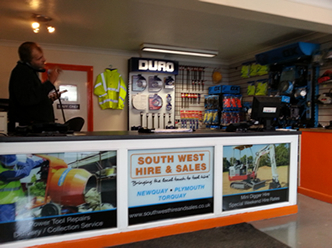 ‘South West Hire and Sales is an independently run Tool hire company with depots in Plymouth, Torquay, Newquay and Exeter. Our Company’s owners, Andy Webber and Mark Williams each have over 30 years experience within the Tool hire industry with both having started their careers as ‘YTS’ trainees. During these 30 years both Andy and Mark learnt their trade by working for some of the big names within the Tool Hire industry until eventually deciding to ‘go it alone’ and opened their first depot at Stonehouse Street, Plymouth in March 2008. Due to the success of the Plymouth depot it allowed us to open the Torquay depot in 2009, followed by our Newquay depot in 2012 and now our newest edition in Exeter which opened in the summer of 2015. The company has a real independent and local feel to it which is promoted by our slogan ‘Bringing the local touch to Tool hire’. The whole South West Hire and Sales team have been ‘hand picked’ from the local areas with every staff member having considerable experience within the Tool hire trade. Andy and Mark are very serious about customer care and encourage their team to be friendly, professional and approachable whilst supplying the highest level of service possible. You need only to give us a try for yourself to see why we are fast becoming the areas favourite independent Tool hire company which is proud to be in the South West.